Jussie Smollett, the popular American TV actor and singer, was charged on Feb. 21, 2019 with the felony of filing a false police report. He faces the possibility of up to 3 years in prison for an alleged hate crime that Chicago Police now says he himself choreographed. His bond was set at $100,000, and upon paying a $10,000 bond he was released from police custody the same day, with a court date set for March 14, 2019. In spite of overwhelming physical evidence and testimony, evidence from surveillance cameras as well as credit card, bank, phone, and text records from Smollett and the two men he hired and rehearsed to do the deed, Smollett continues to plead innocent of any wrongdoing. He originally told Chicago Police that he had been attacked by two men in ski masks with red MAGA hats who put a rope around his neck, poured an unidentified liquid substance on him, yelled racial and homophobic slurs, also shouting “This is MAGA country!” (reference to Trump supporters and Trump’s theme: “Make America Great Again”). However, a witness parking her car nearby heard no sounds of the event, and none were evident anywhere in the surrounding area. In a television interview on Good Morning America Feb. 14, 2019 Smollett inferred that his attackers were white. But on Feb. 13th the case had already started to turn against Smollett and his story. The two “attackers” (two black men) were found and questioned by the police. 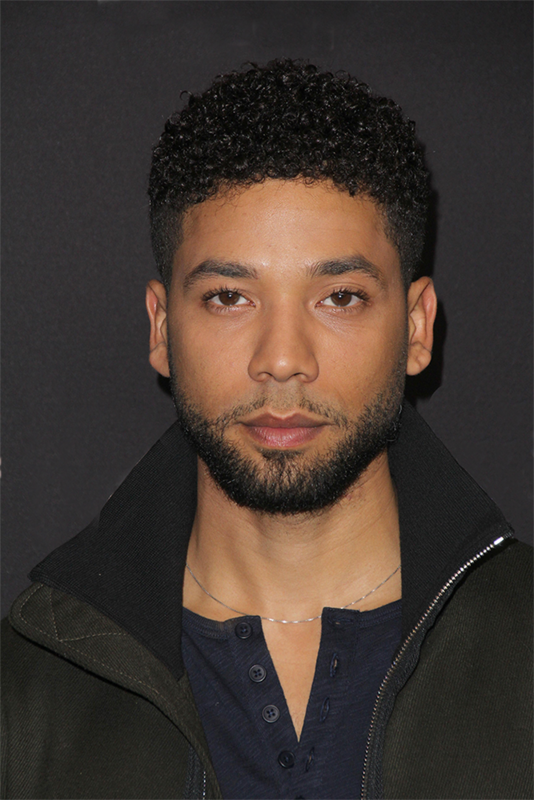 The alleged “hate crime” occurred at 2:04 am Jan. 29, 2019 in Chicago, prior to which the actor, then a star on the TV show Empire, received a homophobic “death threat” letter Jan. 22, 2019 from MAGA. This was one day after a Total lunar eclipse at 6:44 Cancer (sidereal zodiac), thus a more than usually intense period. The letter contained a white powder thought to be similar to anthrax. When examined by the authorities, it proved to be aspirin. Police later confirmed that Smollett went to Plan B (the “attack”), since the letter did not get enough attention by Empire bosses or feature him as the victim. He was also dissatisfied with his salary at Empire. If prosecuted by federal law enforcement, the fake “death threat” letter could bring an even heavier penalty than the staged “attack.” Click here for a brief guide how to read South Indian charts. SOURCE: https://www.nbcchicago.com/news/local/Read-the-Proffer-Prosecutors-Detail-Allegations-Against-Jussie-Smollett-506171221.html The Proffer gives 2:04 am as the exact time of the attack. 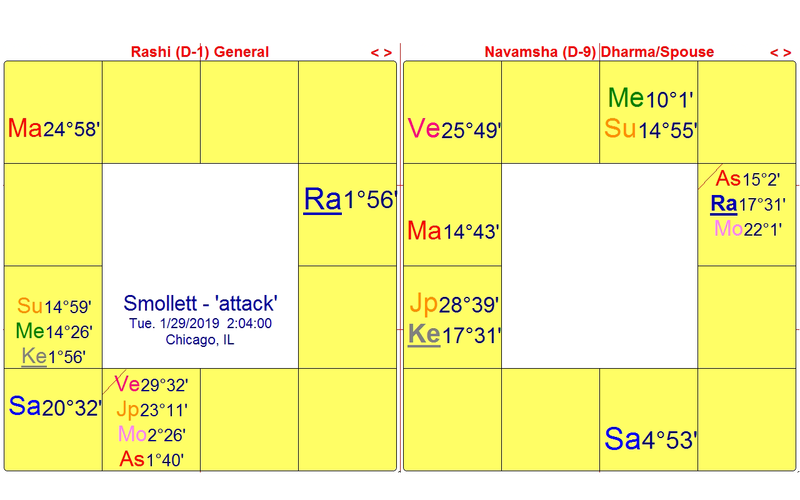 Cancer Navamsha Ascendant runs from 1:56 to 2:13 am CST, Chicago, IL. The chart of the “attack” reported by Smollett does not look at all dangerous – since two major benefic planets, Venus and Jupiter, are in the Ascendant and Ascendant lord Mars is well placed in Pisces in the 5th house receiving a benefic aspect from Jupiter. Mars is the planet of aggression and war, and it is in a harmonious trinal relationship with the great benefic planet Jupiter. Mars also rules over the police and law enforcement; and local police were proper and courteous, treating Smollett as a victim until his hoax was revealed. The “attackers” (two brothers of Nigerian descent: Abel and Ola Osundairo) were friends and colleagues of Smollett from the Empire TV studio. They were instructed to appear to rough him up but not do any significant damage, even allowing Smollett to appear to fight back. Confirming this scenario, the planets form a very nice Parivartana yoga (mutual exchange of signs) between Ascendant lord Mars in Pisces and Jupiter in Scorpio. Mars and Jupiter are also great good planetary friends. The 3rd and 5th houses are linked to dramatic productions, and the 3rd house contains Sun, Mercury and Ketu (south lunar node). Thus, 7 out of 9 planets are either in the Ascendant, the 3rd or 5th houses, all associated with creative activities, including ones aimed at broadcast communications (Houses 3 and 9). One flaw of Venus and Jupiter together is excess – in this case unrealistic expectations from a poorly planned and ultimately criminal undertaking: filing a false police report and spreading a story that presented Smollett as victim of a hate crime, in this case of Trump supporters who were presented as inherently racist homophobes who do harm to black people and others they dislike or disagree with. Having inferred in a television interview Feb. 14, 2019 that his two attackers were white, he thought the ski masks would hide that reality. Since Scorpio, the 8th sign of the zodiac is rising, the event is associated with all things hidden or obscured. The rising degree at 2:00 am (the planned time for the attack) was 0:53 Scorpio. The two brothers arrived on time for the staged attack, but Smollett was late. They stayed close by, and when Smollett arrived at 2:04 am, they proceeded with the “attack” – which lasted for 45 seconds, according to the police account. The very early degree of the Ascendant indicates that it is too early to know what is really happening. In the “attack” chart, the Moon (9th house lord) is nearly at its maximum debilitated degree (3:00 Scorpio), though it receives some correction through several means. Even so, it means that the mind starts out in a disadvantaged state and can be clouded and not thinking clearly due to agitated emotions. Smollett was apparently unaware of the magnitude of his actions, or how easily his movements and his phone calls and texts could be tracked. Though he told his attackers not to bring their cell phones to the “crime scene,” he also assumed that police would not question his story too closely and would accept heavily redacted phone and text records. In the “attack” chart, the Moon gets extra attention in the Ascendant and also because the astrological day is still a Monday. (The Moon’s day runs from sunrise Monday up to sunrise Tuesday.) The Moon is watery, and 4 planets are situated in WATER signs: Scorpio and Pisces. In the Navamsha chart, the Moon goes to Cancer, its own sign (more WATER, more emotion). Cancer is associated with family and/or nation, and once again the Moon is prominent in the Ascendant. But it is closely linked the Rahu, the north lunar node that causes the eclipse of the Moon and brings greater emotional turbulence. Exalted Saturn is the third malefic planet aspecting Navamsha Moon, further exacerbating the lack of emotional, mental clarity and stability. Debilitated Jupiter is opposite Navamsha Moon, giving unrealistic confidence and optimism, though it too gets correction. 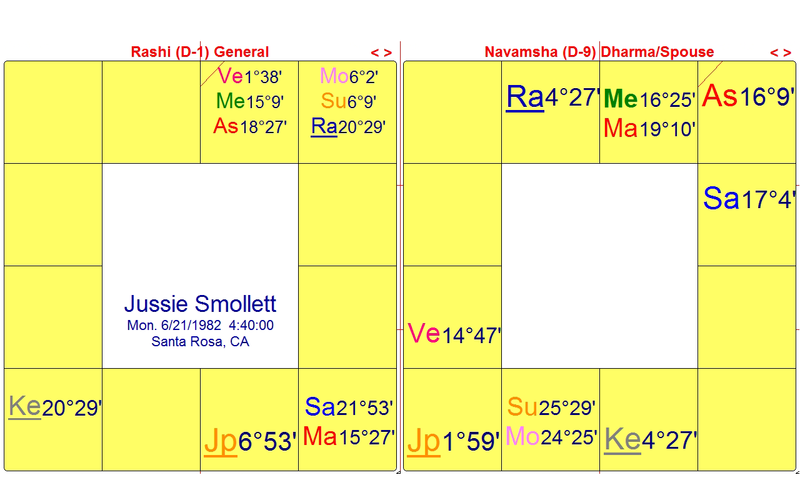 Navamsha Venus is exalted in the 9th house, which is excellent for publicity, as echoed by the non-stop media attention for Smollett after Jan. 29th. But the Chicago Police uncovered the truth from Feb. 13, 2019 onward, when the “two attackers” returned to Chicago and were detained at the airport, held in police custody for questioning, and soon cooperated on this case. The true nature of Smollett’s “hate crime” began to unravel from Feb. 13th with the discovery that the two attackers were hired by Smollett, carefully rehearsed and paid a check for $3500. Smollett’s lawyers say it was for 5 weeks of weight training and nutrition guidance, but this contradicted testimony from the Osundairo brothers. Prior to this, from late Jan. through mid-Feb. 2019 Smollett was running with the attendant publicity as a black, openly gay TV star who was victimized in a hate crime in Chicago. He thought he was on the way to becoming the Left’s major hero and martyr and boosting his visibility on every front. At a nightclub event in early February he was cheered wildly when he told his audience how he fought back against his attackers. In the wall-to-wall coverage of Jussie Smollett, evidently nothing was learned from the fiasco of jumping too early on too many stories before all the facts were in. This includes the incident in Jan. 2019 with the Covington Catholic High School boys wearing MAGA hats. Lawyers for the boys and their families are suing a long list of pundits for defamation and false statements. Among them is The Washington Post, whom they are suing for $250 million – the price Amazon’s Jeff Bezos paid in 2013 to purchase The Washington Post. Click here for a brief guide how to read South Indian charts. SOURCE: Sonoma County Vital Records. Birth certificate obtained by Vedic astrologer and ace data researcher, Steve Stuckey. Many thanks to Steve for tracking down this information! Smollett’s Ascendant is Taurus, ruled by Venus, planet of love and of the arts. Venus has a fierce desire to establish her own version of harmony in the world. Taurus is a fixed sign, and Taurus Ascendant people like material security. They want to establish staying power in whatever they do, preferably also with financial security, especially with Venus in Taurus. Since the eclipse shortly after birth occurs in the 2nd house, we can predict that the individual will experience some turbulence in the affairs of the 2nd house. It rules over speech, voice, eating and drinking habits, and also personal income. This should occur when it receives the effects of Saturn’s transits and/or the effects of eclipses on this axis. Saturn’s transits are even more impactful if one is in the Dasha (planetary period) of Saturn. Smollett entered the 19-year Saturn Dasha Oct. 17, 2016. He is currently running Saturn-Saturn period, and will enter Saturn-Mercury Oct. 21, 2019 thru June 30, 2022. As mentioned earlier, from Jan. 2019 through July 2020 the eclipses occur in either Gemini or Sagittarius. On June 21, 2020 there is a Solar eclipse at 6:13 Gemini, repeating 38 years later almost exactly the Solar eclipse degree at Smollett’s birth. This should be very dramatic for those who have a birth chart with an eclipse so close to the one in June 2020. From Oct. 26, 2017 up to Jan. 25, 2020 tr. Saturn in Sagittarius is opposite Smollett’s 2nd house, throwing the light of truth on these matters and demanding they be addressed. Smollett has a history of one DUI (driving under the influence) in 2007, in which he had no driver’s license with him and gave a false name. He is known to have purchased drugs (Ecstasy, at least) within the past year. He is also very focused on his level of financial income, and the police give dissatisfaction with salary as his chief motive for staging the attack and sending a death threat letter to himself. Tr. Saturn is also in the 8th house from the Ascendant, called Ashtama Shani. This passage of tr. Saturn in the 8th house from the Ascendant or natal Moon is often associated with some sort of loss. In this case, since Smollett has natal Moon in the subsequent sign from the Ascendant, there are two successive periods of Ashtama Shani. The next one occurs when tr. Saturn is in Capricorn in the 8th house from his natal Moon. (Tr. Saturn is in Capricorn Jan. 25, 2020 to April 30, 2022; July 13, 2022 to Jan. 18, 2023.) Right now, tr. Saturn opposite Sun is challenging for the physical health and can pit one against the authorities. As we see here, Smollett was not only challenging his bosses on the Empire TV series to raise his salary (from the current $125,000 per episode), but to pay attention to the anti-gay death threat letter he received from a supposed MAGA person. Next was the inevitable confrontation with the Chicago Police, and to follow will be the FBI, regarding the death threat letter. The uncertainty and instability in the 2nd house is in sharp contrast to the surface impression of the planets in the Ascendant, which bestow yogas (planetary combinations) of success both career-wise and financially. This is due to both Venus and Mercury in the Taurus Ascendant. There are many blessings apparent with Venus in the Ascendant in its own sign, already a good indication for good physical health and a beautiful or handsome appearance. Venus is conjoined with its great good planetary friend, Mercury. Mercury achieves Digbala in the Ascendant (best possible angle of the chart), so this combination is very fortunate as is each of the planets in their own right in the Ascendant. Mercury and Venus conjoined also bestows sweet speech. So there is much on the surface here to be thankful for, and indeed Jussie Smollett’s life and career seemed to be on a remarkable upward trajectory up to late Jan. 2019. He had released his first music album in March 2018, and had been in films, commercials and TV shows since 1987 (at age 5), and in the Empire TV series since 2014. Many of those had been with one or more of his 5 siblings: 2 sisters and 3 brothers. The family was a close and happy one, with both parents present until the father’s death in early Jan. 2015. There are 5 major astrological factors involving the Sun or Moon-ruled nakshatras: Ascendant, Venus, Mercury, Mars, and Saturn, with Saturn having extra weight as the current Dasha lord (Oct. 17, 2016 to Oct. 18, 2035). Then the natal Sun, Moon, Rahu and Ketu are of course on the eclipse axis. Even Jupiter is in a Rahu-owned nakshatra and participates in a Nadi yoga with Rahu: Rahu is in Jupiter-owned Punarvasu nakshatra, while Jupiter is in Rahu-ruled Swati nakshatra. Exchange of nakshatra lords in Nadi Jyotisha provides an important planetary energy exchange, potentially even more important than the sign exchange. So we can conclude that no planet in this birth chart remains untouched by the effects of the Solar eclipse at birth, and it can drive the person at times out of control, if proper spiritual practices are not in place to modify excessive behavior, especially in relation to matters of the 2nd and 8th houses. Clearly Smollett wanted to take command of raising his salary. But he was not properly seeing the many benefits he already enjoyed and was building on in terms of his career and reputation. One might hope that Moon in Gemini ruled by such a strong Mercury would find greater emotional and mental equilibrium. But no, this Mercury is in Rohini nakshatra, ruled by the Moon. Others can be jealous of the Rohini person, and it is possible that Smollett has experienced some of that. But even more significant is the fact that the Moon (and Sun) are so close to the Solar eclipse degree that it can be destabilizing, especially when tested by Saturn’s transiting aspects (as now) plus current eclipses. Moreover, we see that the Ascendant, Mars, Mercury, and Saturn are all located in Moon-ruled nakshatras. So all of these planets reflect that potential mental and emotional instability of a mind too much focused on 2nd house affairs: financial income, speech, voice, and intake of food and drink. With the preponderance of Leftists in entertainment and news media as well as academia, one can see how Leftist activists such as Smollett become emboldened to draw battle lines with themselves as “the only moral force,” referring to Trump and his supporters as Ku Klux Klan – a radical accusation, to put it mildly, but routinely acceptable to Leftist-owned social media. And it was specifically Trump supporters he accused of attacking him. At the recent Academy Awards ceremony in Hollywood Feb. 24, 2019, Spike Lee used his acceptance speech for Best Director as an opportunity to invoke Democrats as the Party of Love, and their political enemies as the Party of Hate. He urged the audience to “mobilize” against the current President in 2020. The audience all cheered and clapped, as expected. In such a polarized political climate, Jussie Smollett clearly sees himself as the Party of Love, which must defeat the Party of Hate at all costs, even if it renders him vulnerable to making such a stupendously false move – one that will surely jeopardize the rest of his life career-wise, along with his personal reputation and credibility. The Chicago Police Superintendant Eddie Johnson said it best: “I’m left hanging my head asking ‘why’?” An astrologer may point, as I do, to the Great Divide across America escalating since the Total Solar eclipse crossed the entire land mass of continental United States in Aug. 2017. Also, in terms of Smollett’s birth chart, one can point to the lack of inner strength to surmount the pressures on his own highly charged eclipse axis. These are coming now from tr. Saturn and the eclipses, thus capable of unhinging a mind and heart that is not properly grounded, and overly tuned into the culture of victimhood as a way to achieve goals. Copyright © 2019 by Edith Hathaway. All rights reserved.